As a healthy office food provider, Monumental Markets has served thousands of customers in the Washington, DC area. Over the years we have seen an increasing awareness among business stakeholders that eating healthy leads to higher production and happier employees. In a nation dominated by fast food chains and empty calories, it can be difficult to find healthy food options. Monumental Markets makes it easy. 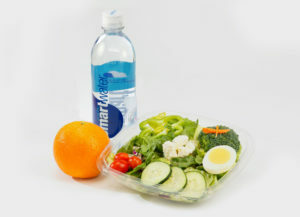 We are a healthy office food provider that offers a comprehensive selection of nutritious and fresh products to the greater Washington DC area. Call us to learn more about our individualized solutions based on customer preferences and specialty needs. We are a healthy office food provider that understands the importance of eating food that is delicious as well as nutritious. Bland, stale, or otherwise unpalatable food does not motivate one to eat healthy. When products are healthy to eat but also taste good, that’s a winning combination. If one does not consume a sufficient number of calories per day and meet the daily nutritional, mineral, and vitamin requirements, energy levels can sag. Morale can be drastically affected when the body is cheated of the healthy food it needs and deserves. This is why it’s so important to choose the preferred healthy office food provider in Washington, DC. Washington, DC’s top healthy office food provider delivers convenience but not at the cost of quality or health. We are a healthy office food provider that enables office workers the convenience of on-premises snack selections without the hassle of leaving the building. This means they do not have to deal with the inconvenience of driving in traffic, finding parking, and returning to the office, possibly encountering delays along the way, or having to shorten their lunch break. When meetings run over, or deadlines are looming, a healthy snack can prevent fatigue. For your staff’s convenience, we also offer delivery and restocking of our products. Our sales associates can arrive at your company at predetermined intervals to ensure your pantry does not run out of selections. As a well-respected healthy office food provider of the greater Washington, DC area, Monumental Markets can provide your company with the nutritional benefits your staff would like—call us today to learn more about our healthy product offerings.